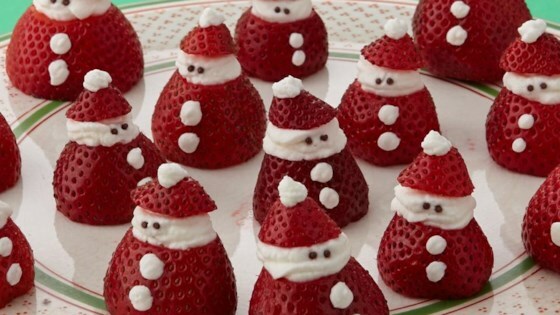 "You can easily make these little Santas as a holiday dessert yourself. All you need are strawberries, whipped cream, and some chocolate sprinkles. Your kids will love these yummy treats and can help put them together." Cut the hulled-side strawberries so they can stand up on a plate. Slice the tip off each strawberry to make the 'hat'; set aside. Beat cream and confectioners' sugar in a glass or metal bowl until soft peaks form. Lift your beater or whisk straight up: the whipped cream will form soft mounds. Spoon a large dollop of whipped cream on top of strawberry base for the 'face' and 'beard'. Set the 'hat' atop the 'face'. Add a dot of whipped cream, using a toothpick, on top of the 'hat' for the 'pom-pom' and 2 dots on the strawberry base for 'buttons'. Place 2 sprinkles on the 'face' for 'eyes'. I made marscapone whipped cream instead of just regular whipped cream, and used mini konpeito (Japanese sugar candy) for the eyes. The whipped cream started melting as I was assembling, so I gave them out to eat while I was making them. They ate them before I could make more. So they were delicious but not too pretty. Cute, but better eat them quickly. Whipped cream doesn’t stay fluffy for long and you will shortly have strawberries floating In cream.